My last Pinterest post has been more popular than I ever imagined. The discussion in the comments has been full of some great questions and some great tips so I wanted to follow-up in case you missed all the extra tips we’ve been sharing. This has been the #1 question in the comments and you’ll be surprised how easy it is. If you have a blog, you just need the Pin it Button but if you’re like most people out there you probably just have photos of your creations saved to your computer. Don’t worry, this is really easy. Just look on your top bar on the right for the Add button. Right where the red arrow is in the photo below. Now choose the center option, Upload a Pin and browse until you find it in the right folder. Then just place it in your board and type a description. Speaking of descriptions, we had a nice discussion in the comments on how important a detailed description is. While a word like “yummy” might describe how you feel about a recipe, try using keywords like “salmon” or “dinner” so other people can easily find the recipe. I tend to forget to write a good description when I’m in repinning mode but I’ll definitely make an effort to do better in the future. Nancy reminded me in the comments of another great way to write a description without having to type. If I see a post I like with a descriptive title and a cute picture, I just highlight the text of the description and then click my “Pin It” button. All the words I just highlighted appear right in my description box and I just have to choose a board and hit pin. I really have no clue. I assume there’s some sort of fairies or magic at play. Really though, the site has a ton of web developers working on algorithms and mechanics and I am not one of those people. If you want to know more about the company and just how it has taken off, Business Insider has a great graphic and background story on Pinterest. One neat nugget of info- Pinterest users spend an average of 1 hour and 17 minutes on Pinterest a day. I’m so glad they aren’t tracking my usage! What’s in Store for Pinterest? Pinterest was at SXSW this week and they shared that they hope to rollout new Pinterest profiles (update: they’re here! see the details about the new Pinterest profiles) that make it easier for us to connect with others and show off our pins. (Details over on my facebook page) I can’t wait to see what that’ll look like but I do expect some glitches to come with it. Don’t forget that Pinterest is still in beta mode (that’s why it’s invite only) so glitches are to be expected. I like to wait an hour and try to be productive. You can always tell when Pinterest is acting up because usually I decide to do some huge crazy project. Pinterest also announced they were hoping to rollout a new iPad app this spring so all you iPad users will finally get what you’ve been asking for. While you wait, go do like some commenters suggested and invite the people asking to join Pinterest over on Pinterest’s main facebook page. Consider it a good deed and share the love. What pinterest feature do you want to see next? Duh, thanks for the info, so simple. I did post some things on my blog just so I could pin them, ha! I hope more people pay attention to their descriptions, kinda hard to search for anything when people keep putting hearts on them. Knew about the @ but not how the # and $ worked, good to know. So glad someone like you is out helping computer illiterates like myself. Over and hour on average, wow, that’s scary! When I tell people about it I warn them not to blame me when they become addicted. But, what a way to go! Julie, Thanks So much for all the tips!! Sure needed them!!! I, too, am addicted to Pinterest…..think my Facebook friends must think I must have gone to heaven. LOL So Julie, where did you go to high school and where is the best place to get toasted ravioli? LOL Yes, I, too, am from St. Louis and for anyone else reading this, it is the two most frequently asked questions of anyone living in St. Louis!!! Take care and looking SO forward to new pins! I’m from across the MO River so I’m an FZN grad and I’m a Charlie Gitto’s fan myself. How about you? Are we sworn enemies because of my answers? Thank you for speaking in simple terms and sharing your knowledge! Is there a way in the works (or an existing option I just haven’t figured out yet!) to be alerted if you’ve already pinned something? I try to periodically review/organize my boards but still invariably end up with duplicate pins when it has been some time since I’ve pinned something and just flat forgot that I’d already pinned the same thing months ago! I’m not really sure if they are planning it. If they are, it wasn’t mentioned in their recent press tour so it will still be a ways off. I don’t like to see all the comments under pins. Also, I’d like a way to e-mail the recipes so I can print them. New features? I’d love a way for pinterest to quickly notify me that I’m about to pin something I have previously pinned, and allow me to either go ahead with the pin, or choose not to. Also it would be great if we could rearrange the pins within the boards, you know, so I could prioritize the items– putting my favourite cat photo at the top, the dog photo at the base. I can’t believe they haven’t already made it possible to rearrange pins. IMHO it would be one of the biggest ways to make pintrest usable. I’d like to see them have some kind of filtering. I wrote to them to complain about such foul language and vulgarity. I am not a prude, but I really don’t appreciate these things. Ok so maybe I am a prude. They wrote back and said they had considered having a rating or filtering system, but had not pursued it. Maybe if there were more complaints, they would. I also made a complaint about some content. I have a couple of followers that have content I don’t want displayed and I am most definitely am not following them but I can’t do anything about others seeing their content. I would like a way to have private boards. YES PLEASE! I would like the ability to have private boards too, whilst I love sharing with others and others sharing with me, I would like to have some private ones we can use for our business for team members to pin ideas for projects coming up or we are working on before they are public, this would really help especially as my team is scattered around the globe! What I’d like to see is some filtering on results. If I search on a particular word, invariably at least half of the results are the same site, photo, and description. It would be nice if the search algorithm would notice that and exclude the duplicates. Another great post of good ideas. Thank you! I would love if the Followers and Following could be put in or would go in alphbetical order….impossible to find someone when you have hundreds…. Thanks for all the tips, very useful. Wondering if you know how to rearrange boards in alphabetical order? If you go to your main page (pinterest.com/yourusername) you can rearrange your boards with the help of the little button right next to the “edit profile” button. You’ll have to arrange them all manually and update it each time you add a new board but you just drag and drop them until you like the arrangement. Pinterest tells me pins cannot be rearranged, but I have bumped into 4 sites that have pins in alphabetical order. So, how did they do it? I have thousands of pins and it takes me forever to look for one, so that alphabetical order would be perfect. Did you ever find out how. Sometimes, I would like to be able to pin the same idea to more than one board. For example, pin a food recipe to “recipes to try” and “gift ideas”. Has anyone else mentioned that idea before? What would the difference be between putting them on a photo website and putting them up on Pinterest? I think that’s a great idea. I would love to be able to have files within files! I have a “craft” file or board, but it has gotten so huge, I wish I was able to break down the crafts, into different categories. I wrote them about it, but never heard back. I also wish there was a way to check for duplicates! And I also am not sure sometimes where to put a pin…. like a Christmas recipe, does it go in my Christmas file, or my recipe file? Sometimes I end up putting them in both, and othertimes not!?! Oh well, sure do love it tho!!!! I just found you on pinterest, and I want to thank you for your posts, they have been really helpful. I agree with pc Brown that I would like to see a notice that I am about to re-pin something I already have pinned, although I think the task of programming it would be monumental. I would love to be able to sub-divide my boards, too. That I would think would be more do-able from a programming standpoint. How do you pin a posting from Facebook? I have tried everything and can’t figure it out. Thanks! For privacy reasons you cant pin from facebook. They don’t want you repinning someone’s personal photos. Your best bet is to save your photos to your computer and upload them onto Pinterest. I would like to be able to combine boards or take a group of pins from one board and repin them to a different board. I totally agree with the dupe check idea however, it should just be a feature you can use as you wish, not automatically for every pin..it would take to long … but they could put a option button to check all your boards at once or separately at the users option. Thanks for the info on how to pin your own work. I was a bit confused at first then realised you only get to view the ‘add’ button from your browser site not if you are using the ipad app. I would love to see a way to rearrange pins(early to late; alphabetically; colour; age etc.) and a way to transfer more pins at once. I would also like to see a way to use a Board background photo/ colour for the pins ( Green leaves for herbs or Red for Valentines day.) I would like more secret or private boards. I also would like a way to block people from my boards. How can you get more people interested in your boards? What are the “seeds” that they talk about. You can buy them $$$ that’s wierd. I have created a number of boards and have pinned various items to these boards. But I also have a board of my own artwork and want to know how these pieces can be seen by others on the main board that opens when you open Pinterest each time. There is NO “Add” button on my top bar… what now? aknteddy, I gave the answer above to Mary and Ned. That should help you if you haven’t gotten an answer yet. I seen this really cute barrette holder that I want to make. But the pattern is in another language. Is there any way I can get it in English? You can always plug the link into Google Translate (https://translate.google.com/) and it should translate the whole page. Don’t worry if you don’t know what language it is in, there’s a detect language option that should help you sort it out. I want the ‘pin it’ option but I don’t want the “ask” tool bar! Is there anyway to just get the ‘pin it’ button? Rusty, I just gave the answer to Mary and Ned above. You should be able to pin your own pictures following the instructions and you don’t need any special tool bar to do it. You can do it right on your Pinterest page. Ok I admit I am not always computer savvy but I cannot figure out how to pin my creations to Pinterest. I cannot find the red arrow and the add that follows it. Where am I not looking? O.K.!!! 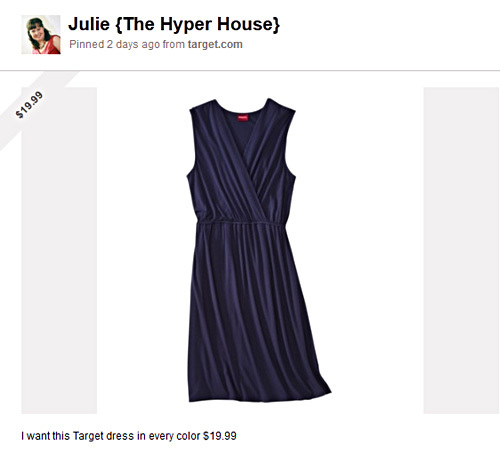 I think Pinterest Has Changed things AGAIN… these hints no longer work as they no longer exist in this set-up!!! Sorry but I can’t find it either!!! I have uploaded things in the past, but it has all changed!! .. Also how do we ask questions of pinterest directly??? I used to be able to do this also..
To Mary Steele and Ned, I got the answer from an expert in the Pinterest Community. So for anyone who wants to pin their own pics to Pinterest this is how you do it. On your Pinterest page you should see a + icon in the lower right corner of the site. Click on this, if you’re asked to install the browser button, click Not now, then click the + again. Then it will give you some options, the middle one will say “upload a pin.” So click on that, then it will say “choose image,” so click on that. Then it should bring you to where you pictures are saved. So you find the pic you want and then you double click on the picture. Then it will bring up another box which will show you the picture and at the bottom of the pic it will say “tell us about this pin,” and you can write a description of your pic if you want and to the right of it, it will say “pick a board.” So you just pick a board and click where it says Saved, and that’s it. You will have saved one of your pics to the new board. I hope that helps everyone who wanted to know how to do that. Now Ned, you asked about how to ask questions to Pinterest directly. You’ll notice, at the top right hand of your Pinterest page, right underneath your name, you’ll see Edit Profile and next to it you’ll see the “wheel”. Click on the “wheel” and you’ll see “get help.” Click on that. Then it will say “visit the help center,” or “contact a Pinterest expert.” Click on the Pinterest expert, and then go from there. I have to say none of their original options helped me, but at the bottom of the page it says, “I still need help.” So when I clicked on that it brought up a box where you fill in the info they need and the question you have and then you submit it. Then they will email you with the answer. Hope this helps you. Hi Ned, You are not a dummy. I have seen the + every time I’m on Pinterest and I’ve never clicked on it to see what would happen. So it took someone else to talk me through it. So I’m glad I was able to help you in return. Happy pinning. Mary, I left an answer for you and Ned. 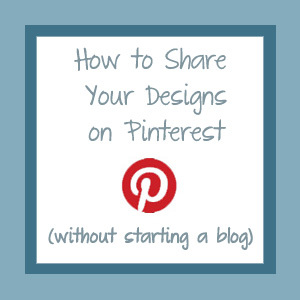 So if you look below you will find instruction that can help you pin your own creations to Pinterest. Ned was able to do it successfully, so I’m sure you’ll have no problem following the instructions. I don’t have the add button at the top of the page. 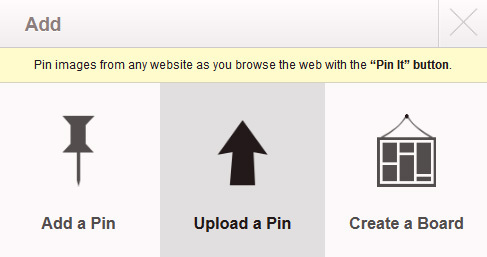 Do you only have the add button if you have a business Pinterest account, or do I need to use a certain web browser? This may sound silly, but I want to post my handmade cards on Pinterest. I’m trying to follow the directions here but I don’t see the red arrow & add button. What am I doing wrong?? Cathy did you figure out how to post your cards on Pinterest? Anyone know how to translate Pinterest on Kindle Fire?